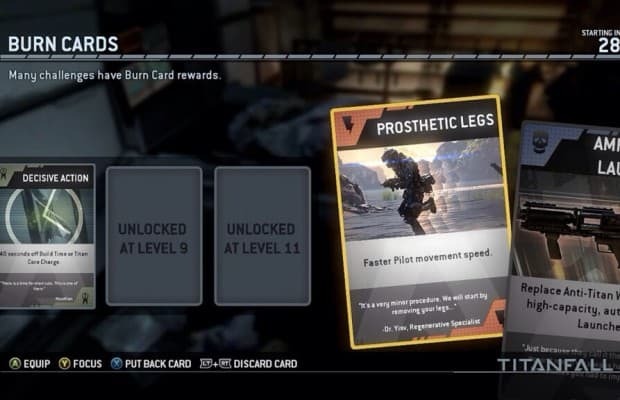 If you had a chance to play the Titanfall Beta, you should be familiar with the burn card system and how to use them. Titanfall appears to feature 50 burn cards in total which we reported last week here and here, many of which can help you inflict more damage between deaths. NeoGAF user ‘RazorUK’ who’s been at the forefront of Titanfall discoveries has found further details relating to the unlocking of burn card slots, and burn card ‘packs’ rewarded to players. According to the user, burn card slots are unlocked between the levels 7-11, and throughout ranking up in a particular generation your pilot is rewarded with burn card ‘packs’. These ‘packs’ include an assortment of burn cards for use in matches. Note: This is all based on the BETA files. They may change things around.